The civil parish of Smallburgh is situated in northeast Norfolk, south of Dilham and north of Barton Turf. Its name comes from the Old English for ‘bank settlement on the River Smale’, Smale being the old name for the River Ant. The parish has a long history, and was certainly long established by the time of the Norman Conquest, its population, land ownership and productive resources being detailed in the Domesday Book of 1086. Setting aside those objects found which are prehistoric but undatable (NHER 25943 and 40050), the earliest evidence of activity in the parish comes in the form of a Palaeolithic flint handaxe (NHER 16262), found in 1978 west of Toad’s Green Farm. A Mesolithic flint tool (NHER 8269) of unspecified type was found to the northwest of St Peter’s Church (see below) in 1970. Neolithic finds to date are two polished flint axeheads (NHER 8272 and 15467) and a piece of pottery (NHER 8259) found near Wayford Bridge. Two possible ring ditches (NHER 36761 and 49421), traces of ploughed-out Bronze Age barrows, have been tentatively identified by aerial photograph analysis. Although unverified, these could be evidence of the earliest structures in the parish. Bronze Age finds are two copper alloy palstaves (NHER 35006 and 40990). The only indication of Iron Age occupation at present is a piece of pottery (NHER 25943). No evidence of Roman buildings has been found, but linear cropmarks (NHER 8274) are reportedly visible from the ground in two fields to the south of Broad Farm, one associated by local tradition with a Roman road. However, a survey of a range of available aerial photographs failed to identify anything other than cropmarks of natural or recent agricultural origin. At Wayford Bridge, a possible wooden boat, (NHER 8259) the timbers of which dated to the Roman period, and part of a wooden causeway leading to the ford that existed before the bridge, were uncovered during excavations for a new road in 1976. Other Roman finds are coins (NHER 8276 and 40436) and pottery fragments (NHER 25943, 40051 and 40052). Part of a Saxon wooden dug-out canoe (NHER 8310) was dredged from the River Ant below Wayford Bridge in 1927. At first thought to be medieval, it was later dated to AD 720, and is the oldest boat found in Norfolk to date, of national importance. Saxon beads and pottery fragments (NHER 8277) were found when a mound was levelled on Toad’s Green in 1856. The nature of the finds and the former presence of a mound suggest that this was a burial site, possibly even a cemetery. Other Saxon finds are a Late Saxon copper alloy spearhead (NHER 8260) and a fragment of pottery (NHER 8194). 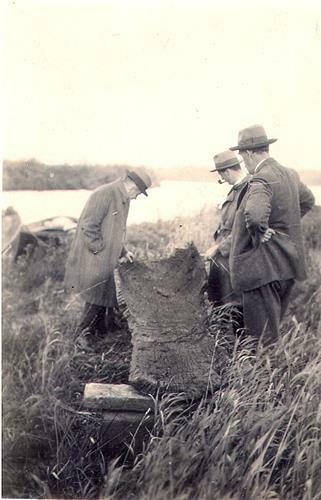 The remains of a Saxon boat found at Smallburgh in 1927. The medieval period has left the parish with its oldest surviving building, St Peter’s Church (NHER 8275) on Hall Road. A church has been recorded on this site since the 12th century but the present building is all 15th century (the 14th century style east window is in fact a Victorian replacement) and consists of an aisleless nave, chancel and south porch. The old west tower collapsed in 1677 and was replaced in the Georgian period with a box-like one. In 1902 the west end was rebuilt with a bell cote, in a rather austere style that sits a little uncomfortably with the rambling graveyard. Inside is also somewhat spartan, mainly the result of a Victorian restoration, but contrast this with the overpowering painted false hammerbeam roof, contemporary with the rebuilt west end, but painted in the 1920s under the supervision of the Rector's wife, with devotional texts on the wall plate. The roof itself looks unfinished, the hammerbeam ends sticking out into the air. A good piscina and sedilia can be seen in the chancel and there is another piscina in the southeast corner of the nave. Another medieval survival is the bottom half of the painted 15th century rood screen, retaining a good deal of colour, though the saints in the panels are heavily defaced. Three more panels are reset on the east wall. The south door, rather damaged, is also 15th century, the octagonal font probably 14th century. Other medieval structures have not survived, but left evidence of their presence in the form of the moat that once surrounded them. Near Smallburgh Hall, a medieval moated site (NHER 22183) is depicted on a 16th century map and is partially visible as a cropmark on aerial photographs.The site has been levelled but a roadside ditch may represent part of the eastern arm. A little over 300m to the north at Old Hall Farm, another moated site (NHER 8302) survives in rather better condition. The moats remain water-filled, with a southeast access to the central island, which has uneven earthworks and is covered in trees and rhododendrons. Medieval objects recovered to date include pottery fragments (NHER 25943, 40049 and 40052), a cauldron rim (NHER 40029), a buckle frame (NHER 40051), a roof tile (NHER 40052) and a stirrup (NHER 8280). Of the post medieval buildings to survive, probably the earliest is Smallburgh Old Hall (NHER 14130). This is a 16th century tower house over a medieval undercroft, extended in the 17th century with a timber frame. Further additions were carried out in the 18th and 19th centuries and barns constructed. The house was re-faced in the 19th century. Much of the original character was lost in restorations of 1982/3. Grange Farm (NHER 14923) on Gunn’s Corner and Manor House (NHER 14924) on Low Street are both 17th century with later additions and alterations. 19th century buildings include the Old Rectory (NHER 47375) on School Lane and Holly House (NHER 8301) on Hall Road. Smallburgh Hall (NHER 13185) on Hall Road was built in 1820 for the Postle family and designed by Reverend William Gunn, an amateur architect. This elegant house is an excellent example of late Georgian architecture. It is built of pale brick and is two storeys high with a slate roof, and has a west façade and central door behind a fluted Doric porch standing on two columns and pilasters with an entablature. A late 20th century one storey extension contains a swimming pool. Wayford Mill (NHER 7448) is the surviving brick tower of a 19th century corn mill and drainage pump. It was converted to a house in the late 1970s. Some post medieval structures are no longer to be seen. Union Farm on Workhouse Road, as the names might suggest, is the site of a workhouse (NHER 8278), marked on an early 19th century map. It was enlarged in 1836 to hold eight hundred people, but by the late 19th century only a hundred lived there. Now only a barn and the ruins of the perimeter wall remain. The Paupers' burial ground here has been suggested as another possible site of the Early Saxon cemetery referred to in NHER 8277 above. Just over the road is the site of a brickworks (NHER 33941), marked on a plan of 1883 and a map of 1906. The most historically recent entries on the record are a group of World War Two anti-invasion defences surrounding Wayford Bridge, which as a river crossing was a location of strategic importance. They can still be seen today, and consist of pillboxes (NHER 7449, 16799 and 16800) and anti-tank mortar emplacements (NHER 16800 and 32580). P. Aldridge (NLA), 25 July 2007.
http://www.norfolkchurches.co.uk/smallburgh/smallburgh.htm Accessed 18 July 2007.